I don't know about you, but when kiddo and I go to the farmer's market, our minds turn to big, farm-fresh salads cupcakes. I'm pretty sure he chose this recipe so that zucchini I bought wouldn't show up on his dinner plate. The cupcake and frosting recipes come from Martha Stewart's Cupcakes. 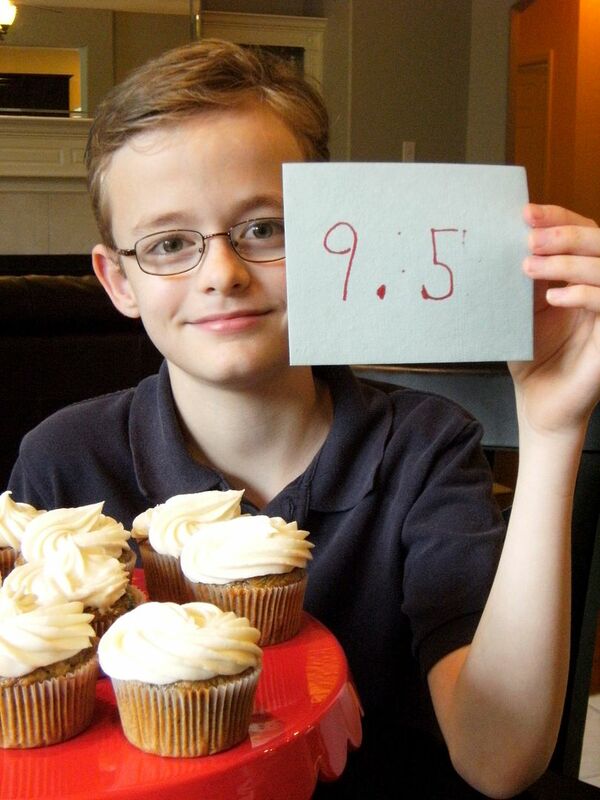 We halved the recipe (I really don't need 24 cupcakes sitting around the house). Line a muffin tin with 12 paper liners. Whisk together the flour through cloves. In another bowl, whisk together the oil, egg, vanilla and zest. Whisk in the brown sugar until smooth. Stir in the zucchini. Add the flour mixture just until combined; stir in the walnuts. Divide the batter evenly between the cups. Bake, rotating halfway through, about 20-24 minutes. Cupcakes will spring back when lightly toughed in the center and a toothpick should come out clean. Cool in the pan for 10 minutes. Remove cupcake to a cooling rack and let cool completely. 1 stick unsalted butter, room temp. 6 oz. cream cheese, room temp. Beat the butter and cream cheese on medium-high until fluffy, about 3 minutes. Reduce speed to low, and1/2 c. sugar and vanilla. Mix until smooth and combined. Add the remaining sugar 1/2 cup at a time, beating after each addition until smooth. Kiddo said he wanted to try piping instead of spreading the icing. He did a really great job...and I couldn't get enough of watching him. These cupcakes are wonderful...moist and full of flavor. And, you can never go wrong with cream cheese frosting! We think you'll like them! What a darling son you have! LOVE, love, love the "rating card" of 9.5! Looks like I must get some zucchini asap! Ella is reading this with me. She wondered at first why Kiddo was grating a cucumber! 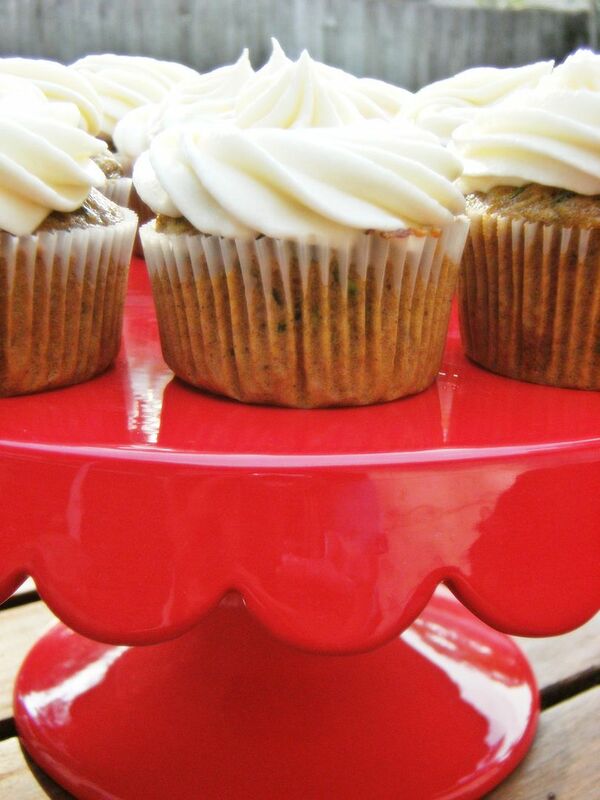 LOL I've made zucchini loaf, nice and spicy, similar to these cupcakes which I've never made with zucchini. Kiddo's treats look delicious as does the cream cheese frosting. He's a whiz with a piping bag! I just baked the blondies but now I want to do that! I have everything needed. Tomorrow maybe ? yum! I love all the pics too! He did a great job! Zucchini Spice cakes are my fave... esp with chocolate chip & walnut! yum yum! Your son did an amazing job with the frosting - they look very scrumptious indeed! Yum! I am going to save this for when our zucchini is ready, we have a few buds starting to pop up in the garden! Kiddo is quite the expert piper! 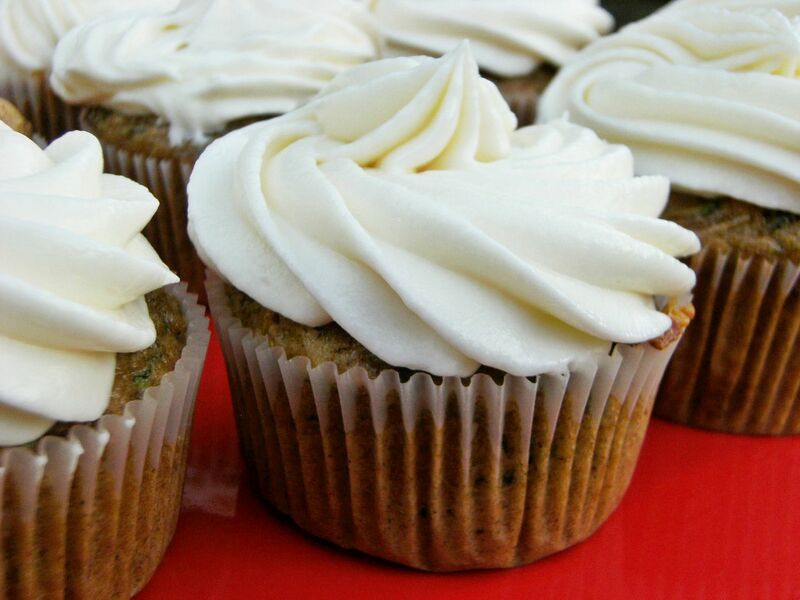 These ZUCCHINI Spice Cupcakes look heavenly! I just know they are scrumptious with the Cream Cheese Frosting! I got lots of ZUCCHINI at the market today! I'm going to grate it up and use it to make Turkey Burgers! I'll post about it this week! You may like to try the Turkey Burgers since it seems you are a MASTER at grating that ZUCCHINI! You crack me up just like your Mom does! 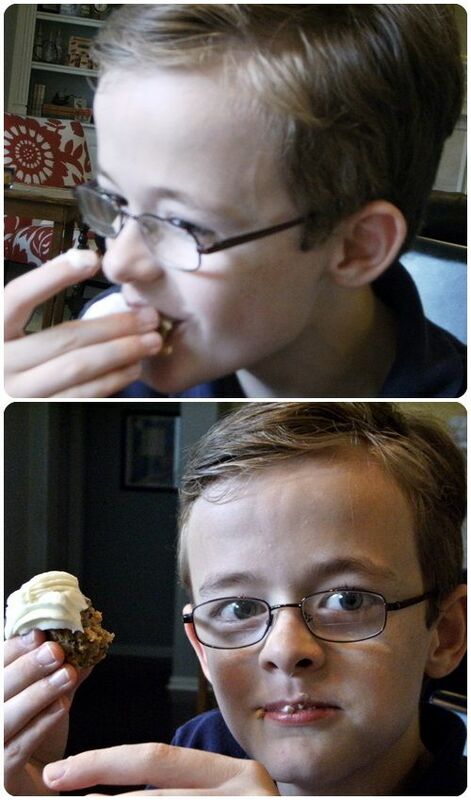 The two of you need to enter a Mother/Son baking contest! I just KNOW you'd win! 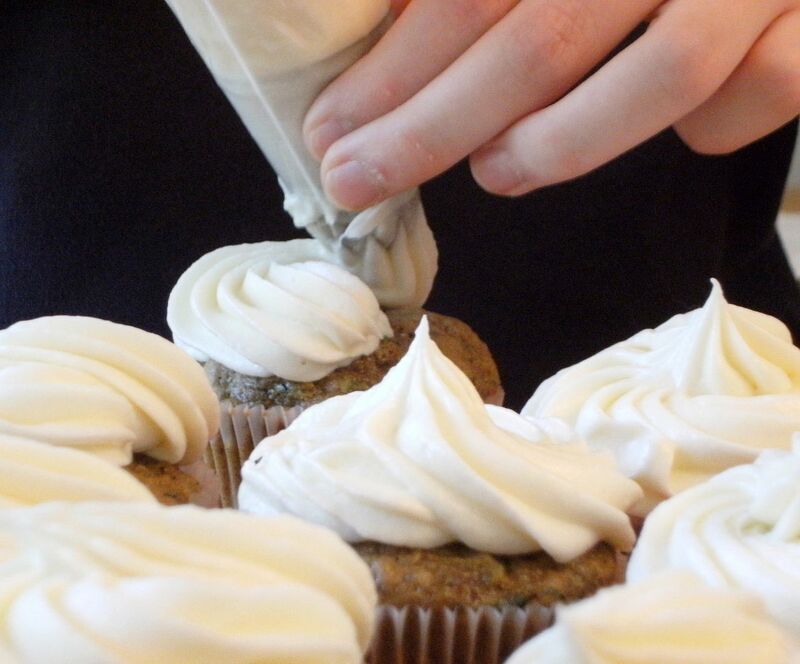 You did a FAB job piping that Cream Cheese frosting! And you are right...PIPING that icing MADE the cupcakes! That way they look so professional! You are one handsome DUDE! Do the girls at school know YOU can COOK???? You may not wanna let them in on this secret! If you do...they'll be SWORMing!!! I mean like out of control! I LOVE it when you share your recipes on Bake at 350! GIve your cute Mom a big ole HUG!!!!! Those look and sound so good! Kiddo did such a good job on the frosting and the grating! How fun it must be to have him in the kitchen with you! Thanks for sharing!! These look fabulous!! 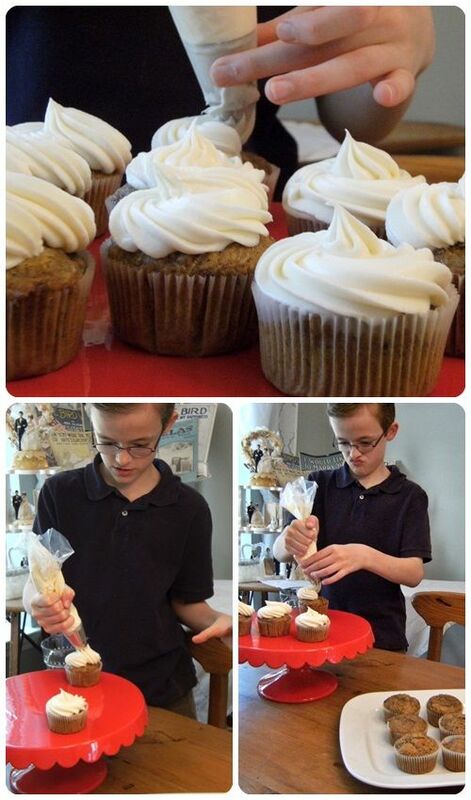 I love the photos of your son piping the frosting, they all look so professional! Wow...your son did a wonderful job frosting those! He is very handsome (cute). The recipe sounds yummy. kudos to kiddo in the kitchen! to a future executive pastry chef! I have been wanting to try those cupcakes for a while now..your look absolutely perfect! I am pretty sure I love your kiddo. Those expression as he was decorating... priceless! And the third picture down... that is AWESOME. I think you should print out an 8 x 10 and frame it and send it to me. What. Thats not weird to have pictures of other peoples children baking. 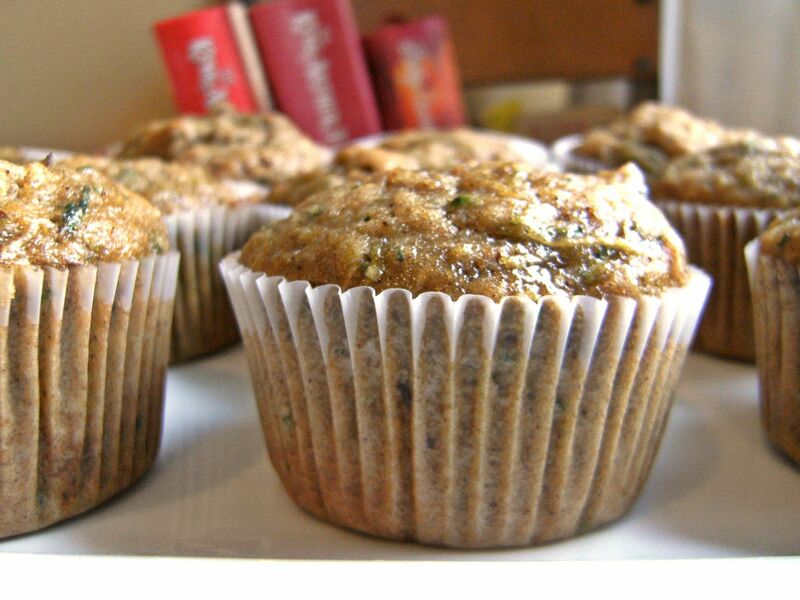 Zucchini bread is one of my favorite things so I bet these are delicious. One of my all time favorites and I've been using a recipe that's been around Before Martha. Amazing how similar though but from a cookbook of my mothers that was put together by the women of a church we went to when I was a girl...must be 45+ years old! 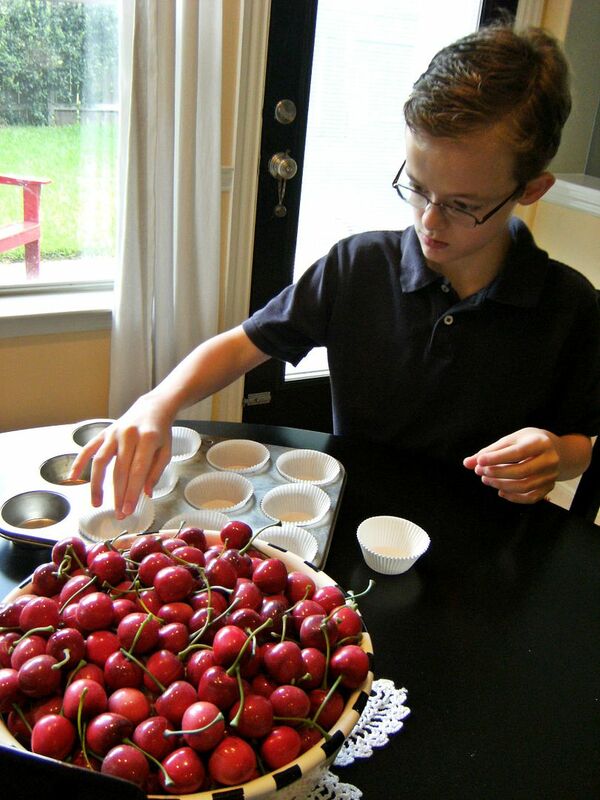 Your son did such a great job; love that he will work with his mom in the kitchen. His piping technique? Seriously...that boy does good work! When zucchini is so abundant you can't think of another dish? I grate up and measure into 2 cup portions and freeze to use for making zucchini breads in the winter! I love how he is concentrating very hard on piping the icing! So cute. 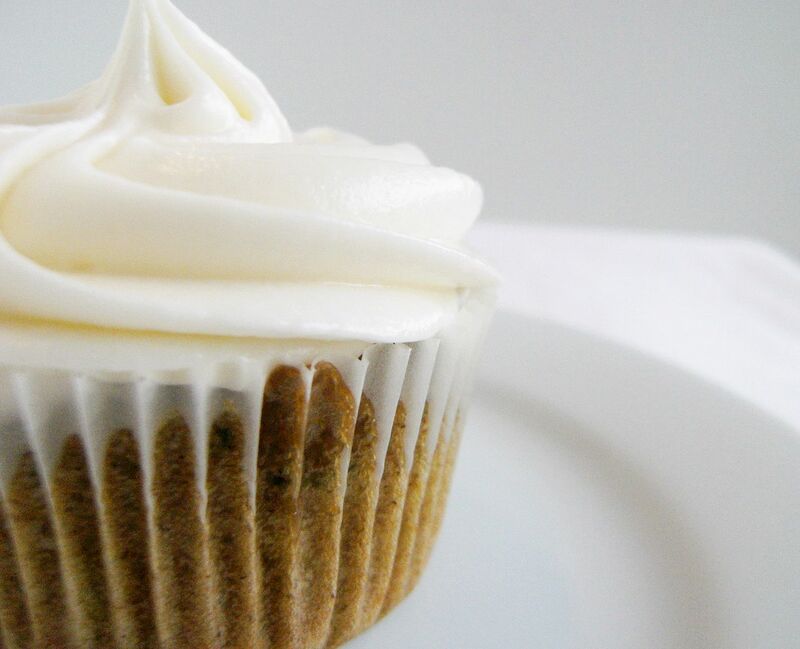 These look delicious and slightly more healthier than other cupcakes due to the zucchini! These look great! Great job on the frosting kiddo! Oh my goodness, how cute. Do you have a collection of vintage brides and grooms over in the corner? If so, that's simply fabulous. Anything with spices AND cream cheese icing is a winner! You are so so so so lucky to have your sweet boy at home with you! Gracious! He's precious! And those cupcakes are To. Die. For! Thanks for another beautiful post and recipe. I created Frog-prince cookies using your recipe again and they were a huge hit - as are all the cookies I make using YOUR recipe! I'll never be able to thank you enough! Your little helper there is sooo good with piping! Mine, did you see that gorgeous swirls that he piped on the cupcakes! I'm so impressed! Cute little helper you've got there! the cupcakes look divine! I love these posts!! 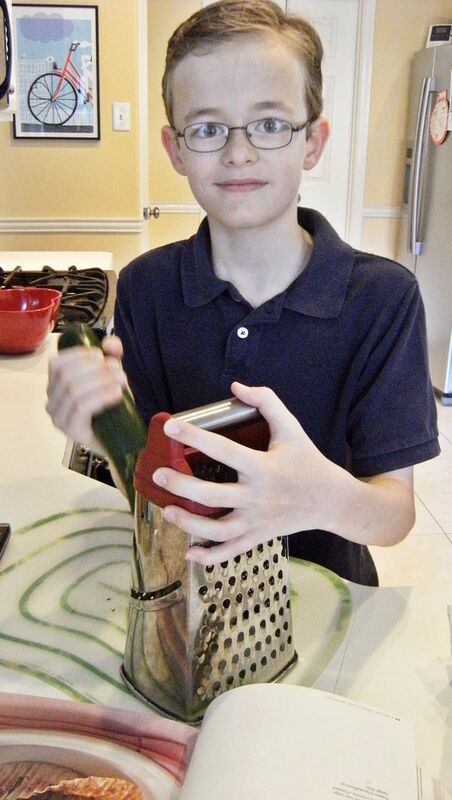 I love how your son likes to help in the kitchen!! These sound so yummy! 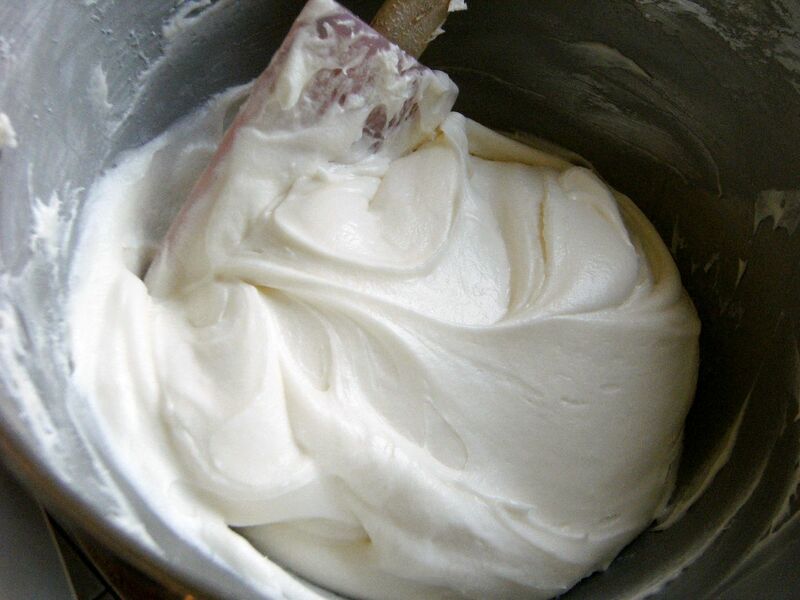 !.....we made cream cheese frosting the other day too!! He did a fantastic job piping that frosting!! What can be better than kiddo in the kitchen? So great that he enjoys being in there with mom so much. Makes me happy to see! I've made chocolate zucchini cupcakes, now must try these! I wish I could frost cupcakes so well! You son is an expert piping, what a wonderful helper you have. The cake indee, look super moist and yummy. Have a great week. Wow he did an awesome job icing those cupcakes! yummy! Hi - found your blog 4 days ago, and have now read all your posts (stalker)! I'm kidding, but right now, I'm obsessed with cookies. I made your royal icing over the weekend, but found that it didn't stick to the cookies. When you break them, it flakes off. What did I do wrong? In case it's not obvious, I'm now following your blog and I love it! Welcome! So glad you're here! Some flaking of the icing will happen when you break a totally dried cookie. If your piping is breaking off, it may have been just a bit over beaten. My husband seemed VERY interested in this post :-) I think I will be making these soon!!! Thanks so much! I have been LOVING the Desserts for Dudes recipes - such a great idea!!! Everything here is fabulous as usual! I would have tried a bunch by now if I had a bit more time! Thank you! LOVE this! 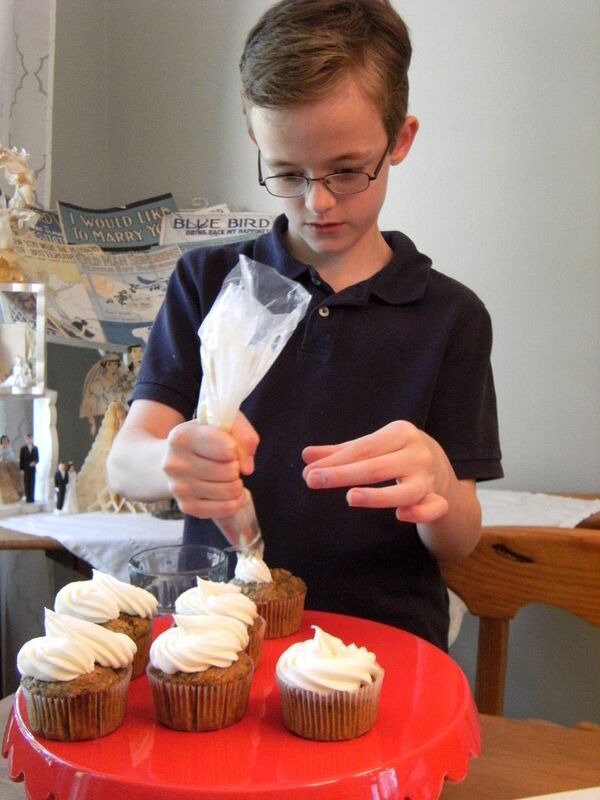 Your son is quite the little pastry chef... Love the pictures of him piping the frosting. 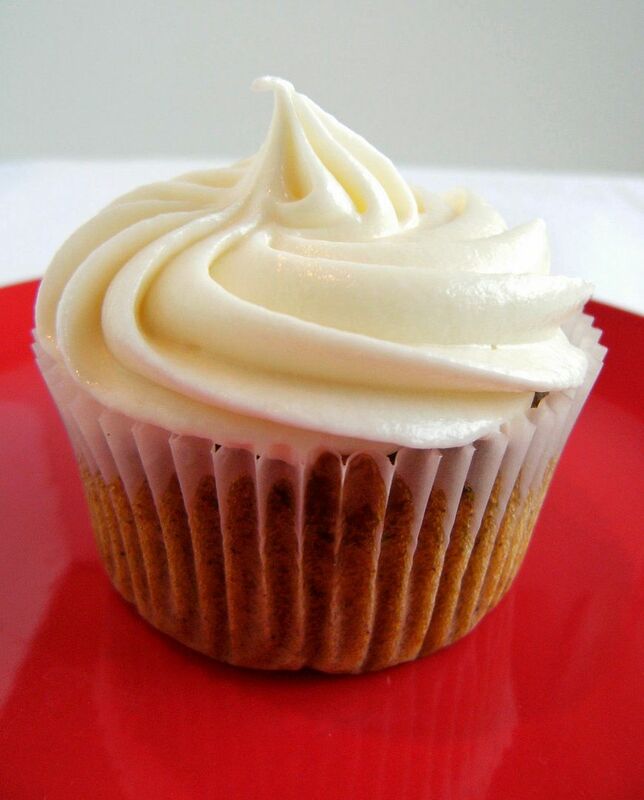 We must think alike because I have some leftover cream cheese frosting from the cupcakes I made over the weekend, and I've been thinking about making some zucchini cupcakes! Great job, kiddo! Those look absolutely scrumptious, and he did a better piping job than I could ever! And that little scrunched-up face he was making when piping was so cute! I have been saving this recipe for the over abundance of zucchini in my garden. I just made these cupcakes! They smell divine, but I cannot eat them yet =( Thank you for the recipe! I am always looking for zucchini recipes as I always grow too many plants! I love your blog and look forward to your posts!